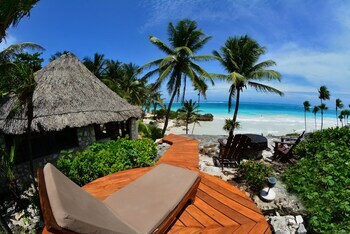 When you stay at Diamante K in Tulum, you'll be on the beach, within a 10-minute drive of Tulum Mayan Ruins and Tulum National Park. Featured amenities include a 24-hour front desk, luggage storage, and a safe deposit box at the front desk. A roundtrip airport shuttle is provided for a surcharge (available 24 hours), and free self parking is available onsite. With a stay at Hotel Aqueronte in Ixtapaluca, you'll be 22.7 mi (36.6 km) from Palacio Nacional and 22.8 mi (36.7 km) from Zocalo. Free self parking is available onsite. A stay at Maya del Mar places you in the heart of Playa del Carmen, steps from Quinta Avenida and Playa del Carmen Main Beach. With a stay at Costa Linda Caleta Acapulco in Acapulco (Caleta), you'll be within a 10-minute drive of La Quebrada Cliffs and Playa Caletilla. Free self parking is available onsite.